HomeGiveawaysWAC Tickets and Jose’s Tacos: A winning combination! WAC Tickets and Jose’s Tacos: A winning combination! Congratulations to Helen Urban of Fayetteville! Helen won the four tickets to see The Gruffalo at Walton Arts Center and dinner at Jose’s Mexican restaurant! Helen has two kiddos, 5-year-old Kelsey (well, she will be in November) and six-month-old Joseph. Helen was excited for Kelsey to see the show, which centers around the lead character Mouse as she wanders through the forest. Along the way she meets a sly fox, a cunning owl and a sneaky snake. 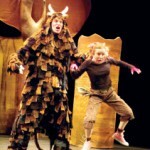 Though she’s small in size, Mouse uses her creativity to scare off enemies by inventing tales of a fantastical creature called the Gruffalo. Her plan works perfectly until she comes face to face with the creature she imagined. 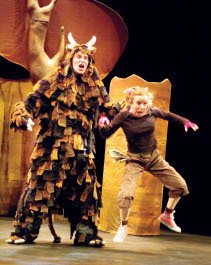 Mouse’s encounter with a real Gruffalo is surprising, but she soon learns that what might be scary to imagine can be wonderful in real life. Filled with songs, laughs and scary fun, the show was called “irresistibly charming” in the New York Times review. As an added bonus, this production kicks off “Pajama Night” at the Walton Arts Center. So any kids who arrive in their pj’s or with their favorite stuffed animal will receive a special treat! Tacos & Tickets: Jason and the Argonauts at WAC! 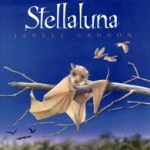 Tacos & Tickets: Take your batlings to see WAC’s Stellaluna for FREE! Bath Junkie: A Good, Clean Addiction!